This is a 75 GPD (Gallons Per Day) Membrane Filter. 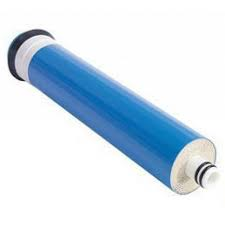 This semi permeable membrane effectively reduces TDS and sodium as well as a wide range of contaminants such as Arsenic, Lead, Percholate, Chromium, Copper, Radium and Protozoan Cysts including Giardia and Cryptosporidium. The heart of your Reverse Osmosis system reducing impurities down to 1/10,000 of a micron.